Most business owners start their entrepreneurship journey because they found out that society has been misleading. A 9-5 no longer means job security! People of great professions and educational backgrounds have been laid off. Struggling to find the next job to support their family. Then something happens. You are up all night, thinking about your passions, aspirations that you now have the chance to live out. You yearn to pursue life on your own terms. You desire to make it on your own, build security with your business. Most entrepreneurs start their business on shoestring budgets. Teeny budgets are perfectly fine. I have done so too! To ensure that your business will be secure, you have to understand your spending habits and ensure that you're never leaving money on the table! You don't want to have 20/20 hindsight vision on where you could have saved on taxes if only you documented them correctly when you started your business! You're entitled to these tax deductions, and I want to share 10 tax deductions that you never want to miss! Start-up costs are everything that you acquire before opening up for official business. Before taking your first client or making your first sale. The extensive research, planning, and spending that you did behind the scenes while birthing your business is all tax deductible! You can create a spreadsheet of everything that you've spent (even if you used your personal account). I began my online experience as a blogger on my personal blog, Yannivlovely. I later took the plunge and started a service-based business for bookkeeping, graphic design, and virtual assisting. During the months of preparing for my business, I incurred expenses. I acquired a business license for $100 in my state (Georgia). I launched my business site to SquareSpace, bought my domain name, and signed up for ConvertKit for my email marketing. I then started working with my badass business consultant. 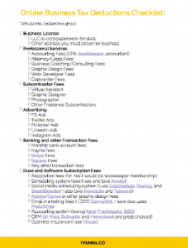 According to the IRS, if you have exceeded $5000 in startup costs (Dang you conferences!) you can amortize your costs over the duration of 180 months (aka spread it over time). "Amortize expenses over $5000; you will gradually write them off in the duration of 180 months." This one is huge for creatives! You may not have realized, but when you’re heading to the chapel to shoot a wedding, the mileage is tax deductible. This year, the taxable rate for the United States is $0.54 (from $0.57 last year). If you’re a fashion blogger meeting with your graphic designer downtown, the mileage you go from your home to your meeting place is tax deductible. When you’re gathering materials at Michael's for your stationary business to create a custom order, (the materials are necessary for your business! ), you guessed it; the mileage is deductible! Finally, as an Etsy seller, when you drop off your packages to UPS, you better make sure you track those miles!! Properly deducting your home office is often looked over. I want to make sure that those beautiful offices you crafted and shared on Pinterest are accounted for on your taxes at the end of the year. The thing about home offices is that the office has to be used solely for your business. Although you’re living the dream of a laptop lifestyle, you cannot claim your couch where you do a slew of YouTube videos, the kitchen table where your food blog comes to life, or your bedroom where other magic happens besides business. In order to be able to deduct your working quarters, you would need to have a dedicated space where your business resides. Want to avoid leaving money on the table?! Download my FREE Tax Deductions Checklist Now! I did some research where I was able to find a bank that did not charge for opening business checking accounts by going to my local credit union. I suggest all entrepreneurs have an open mind to credit unions to have the chance to avoid monthly fees. If it comes that you cannot find a bank in your area that is free, your monthly charges are tax deductible. But when I started my business, I couldn’t shake the services charges of PayPal or Stripe! When your course payment choices are both Stripe and PayPal (both have identical service charges of 2.9 and $0.30), you are never receiving the full 197 you charged for! Those babies sure add up! But the good news is they are entirely deductible. An added bonus: when you have a stellar bookkeeper and accounting system, you will know exactly what your charges are at the end of each month. You can also estimate those charges when you are setting up a budget for the quarter or year! Business insurance is imperative, even online. The task is to find an insurance agency that will accept you as a newbie business, is another fete. The big dogs like State Farm do not accept baby businesses (Gah!). I was able to get a great deal with Hiscox. Definitely, shop around for insurance in your industry. Make sure your insurance is up-to-date. As your business is growing, there are chances that your coverage needs will increase. For example, when you start to hire employees or add on new services that are separate from the scope of practice. When you start your business, you will need help from professionals. Whether it be an attorney to get your contracts and other legal documentation in order. An accountant to ensure your starting off everything financially stable. Or a bookkeeper, like me, to ensure that your day-to-day processes do not get overlooked. All of these are tax deductible. I spoke about this earlier. When you run an online business as a creative, there are different aspects of materials that complete your finished product. For example, you create stickers online in Etsy, and you need to buy a cardstock, adhesive, and anything else that is needed to complete your project! Thorough documentation such as his is also great for your pricing structure! When your accounting system has a category of “materials” in the chart of accounts, you're making big moves! What you spend is right in front of you, the hours spent (assuming) are tracked, the documentation of mileage, and the shipping labels accounted for. Hello streamlined pricing structure! Documenting the costs of internet and phone consumption for your business all about the estimates. At the end of the year, you give your accountant or tax preparer a rough estimate of the percentage of your business. What if you can have more accurate estimates right here and now?! I recently got a free Google Voice number. It’s great because it links to google hangouts via the internet (video conferences) or your phone. You get a log of your calls and texts. You can even set business hours on when to receive business calls! Using Google Voice will provide me with getting a better estimate at how often you use your phone and internet for your business. Another example, I added a hotspot to my phone service strictly for business on the go. The portion of the hotspot costs, as well as the estimated percentage of usage for my phone, will be paid with my business account. The rest with my personal. You’re separating this expense beautifully! Meals and entertainment expenses have a laundry list of a history of being taken advantage of by business owners before our time! People used to think that they can write off country club subscriptions or season basketball tickets as a tax write-off! The IRS has gotten stricter. You need to show proof that everything is related to business. You need receipts! Meals that directly relate to your business like taking a potential client out for coffee are deductible at 50%. If your potential (and high profile) client loves basketball, and you take him or her to a game it’s deductible at 50% as well. Just ensure that you have proof and documentation to ensure that you’re covering yo'self! ** AS OF THE TAX YEAR 2018, ENTERTAINMENT IS NO LONGER DEDUCTIBLE. MEALS ARE STILL DEDUCTIBLE AT 50%. THE DIFFERENCE IS THAT WHEN YOU'RE HAVING A MEAL WITH A CUSTOMER OR CLIENT, ONLY YOUR MEAL IS DEDUCTIBLE! Your business is online, but you look forward to business conferences that will increase your business experience substantially! You also want to network with people in your niche and decide that it’s worth the money to become a part of the network by paying a monthly fee (i.e. the blogger association, or AICB). You own a craft business, and one of the best ways to show off your work for a broader audience is to go to a trade show once a year or a convention! Smart and cohesive bookkeeping throughout the year warrants a painless tax period. How was your most recent tax season experience? Did you notate everything as other expenses? Did you have to thumb through your bank statements to see what you’ve been spending money on and in what category? I want to give you a way to make sure that this is not going to happen again. When you sign up for the checklist of tax deductions to look out for, I will also provide you with a spreadsheet of a Chart of accounts that I use for my creative clients and business. You can just import this in your online accounting system like Xero, QBO, Freshbooks, or Wave. This way, you’re able to DIY your books correctly and have excellent documentation of your expenses to later on in the tax season. Are your books taking over your life and you’re ready to outsource your bookkeeping? Find out more about my accounting services right now! Fill out my intake form and we can set up a free consultation to see if we are a good fit for each other!